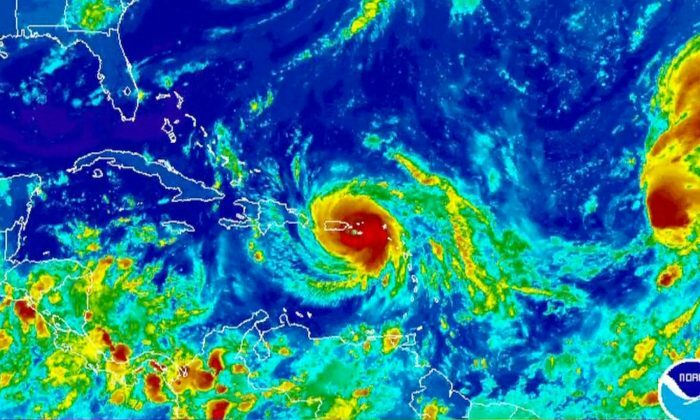 Hurricane Maria is slamming Puerto Rico with Category 4 winds, according to the U.S. National Hurricane Center in an 11 a.m. ET update on Wednesday, Sept. 20. “Destructive winds and flooding continue over portions of Puerto Rico,” the NHC statement reads. 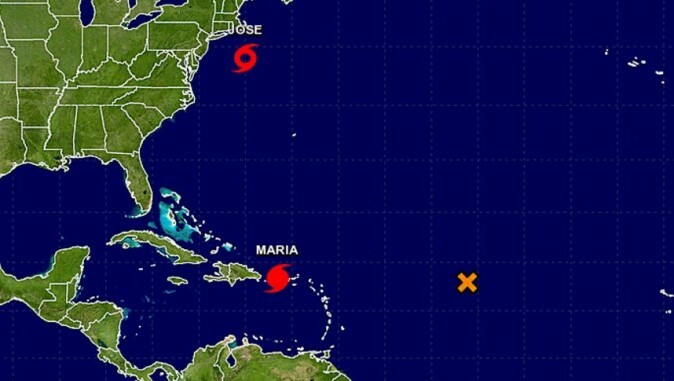 Meanwhile, the “center of Maria is approaching the northern coast” of the U.S. commonwealth. It’s 15 miles from Arecibo and 25 miles from San Juan—the capital. 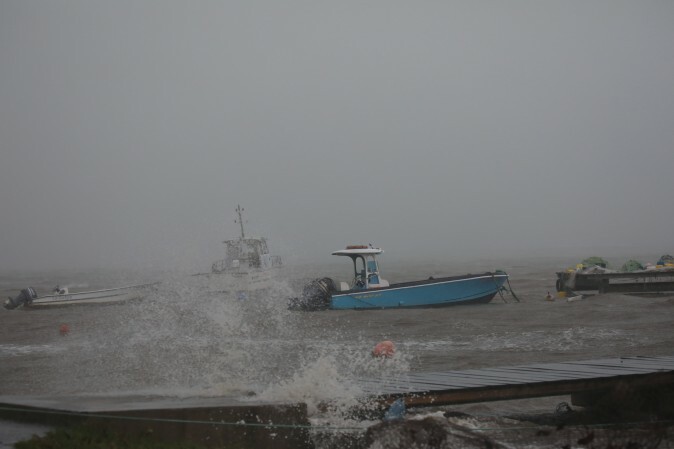 It has maximum winds of 140 mph, according to the agency. It’s moving northwest at 12 mph. The Weather Channel said that Maria is doing “major damage” to Puerto Rico. 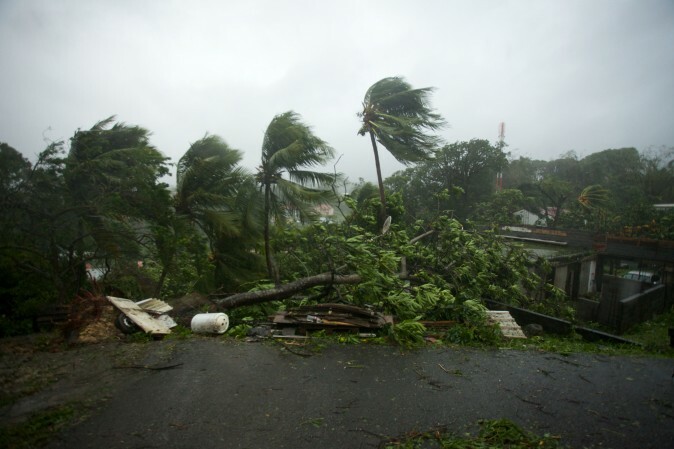 Buildings trembled as the storm battered San Juan and sent torn off pieces of metal barricades clattering along streets, noted Reuters. Broken windows, mangled awnings, and gutters dangled haphazardly from buildings or were ripped off entirely. Toilets bubbled noisily and belched foul air as the hurricane rumbled through the city’s water and sewage lines. 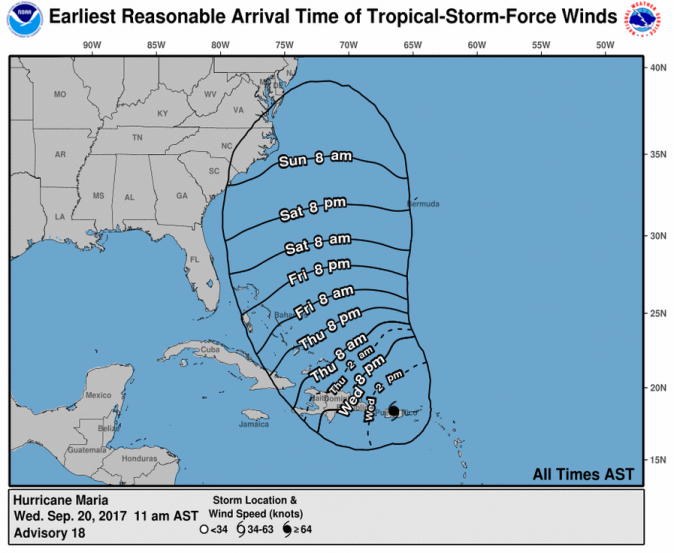 On its passage through the Caribbean, Maria killed at least one person in the French territory of Guadeloupe and devastated the tiny island nation of Dominica. “We have not experienced an event of this magnitude in our modern history,” Puerto Rico Governor Ricardo Rossello said in a televised message on Tuesday. “Although it looks like a direct hit with major damage to Puerto Rico is inevitable, I ask for America’s prayers,” he said, adding the government had set up 500 shelters. A picture taken on Sept. 19, 2017 shows the powerful winds and rains of hurricane Maria battering the city of Petit-Bourg on the French overseas Caribbean island of Guadeloupe.